VANCOUVER, BC. July 30, 2018 – Hollyburn has expanded their portfolio to incorporate a commercial building alongside their traditional apartment-style buildings, prompted by the sale of their current head office and residential property at 1650 Alberni Street in Vancouver’s West End. 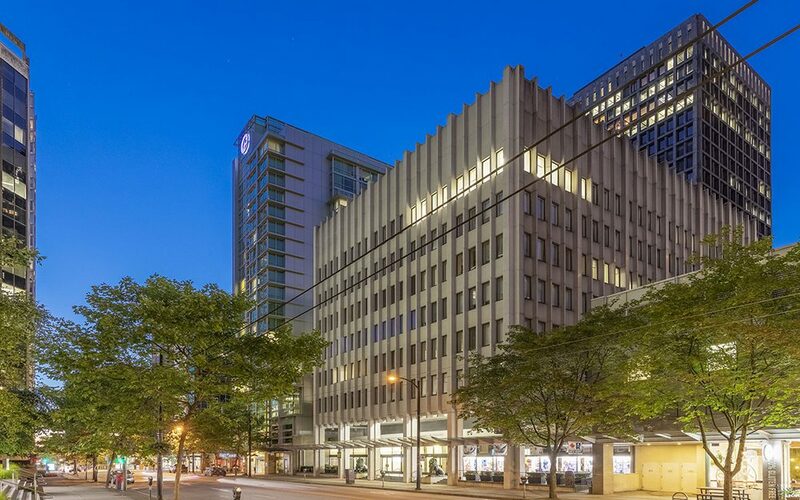 The property management company has taken this opportunity to move closer to the city centre by purchasing the office building at 1155 West Pender, which is set to become their new head office in early 2020. As an innovative front-runner and the largest owner operator of apartment buildings in Vancouver, it was important for them to continue to diversify their asset base in an extremely competitive and somewhat uncertain market. The physical reality of the dated, more maintenance-heavy Vancouver apartment building stock, coupled with the economic reality of high valuations, transfer tax, and change of legislation, plus other punitive political risks, made the prospect of a commercial building an attractive offer, when presented to them by their network of commercial real estate professionals in an off-market situation. In a time when the downtown Vancouver office market has the second lowest vacancy rate in North America at sub 5%, according to Colliers International, the move offers Hollyburn Properties LTD promising opportunities for further growth, expansion, and development. And they’re not alone in recognizing the benefits of a central downtown office, as the neighbourhood is rapidly transforming with new commercial property vendors snatching up available space, including: Reliance Properties, Oxford Properties, and Bentall Kennedy. Sharing the building with Hollyburn will be anchor tenants Continuing Legal Society and Bazinga Technologies, both with full floor plates. For future leasing inquiries contact Kim Hollet at Hollyburn Properties Ltd. and Geoff Donnelly at CBRE. The industry leader is enthusiastic about the move, as the location of their new office presents easy access to public transportation, reputable restaurants, and eclectic shops, but more importantly it’s near 30 of their apartment communities downtown, fostering an environment where customer service and efficiency can be at the forefront. Not to mention, the property “satisfied [their] short-term requirements as an owner user on a 11,400 sqft floor plate with 12-foot ceilings, [their] medium-term requirements of repositioning the property for accelerated rental growth, and [their] long-term requirements as a property with strong redevelopment potential on a 16,511 square foot site with dual Hastings and Pender street frontages,” as stated by Allan Wasel, at Hollyburn. This new building is just the beginning of exciting expansions for the property management mogul and we’re sure it will spark further avenues for future success and diversification. practices to the benefit of their residents, their employees and the property management industry as an entirety.